The researcher observed that nurses prefer not to nurse patients with an open abdomen as they fear that the abdominal contents will protrude. The purpose of the study was to explore and describe the experiences of registered nurses taking care of patients with an open abdomen in intensive care in an academic hospital in Gauteng, and to provide recommendations for registered nurses when taking care of patients with an open abdomen. The research design used was a qualitative, exploratory, descriptive and contextual design. Focus group interviews were conducted with each group comprising six participants. The research question was: What are the experiences of registered nurses caring for patients with an open abdomen in an intensive care unit? What recommendations can be made to assist registered nurses in taking care of patients with an open abdomen in an intensive care unit? The data was analysed using Tesch's method. Three themes emerged: Difficulty in nursing care, complications such as fistula and infections, and poor hospital administration. Recommendations for assisting registered nurses in taking care of patients with an open abdomen were then made based on the findings of the four focus group interviews. Ethical principles and measures of trustworthiness were adhered to throughout the research study. Open abdomen surgery is a surgical procedure that takes place in theatre and is also known as a laparotomy. In this type of surgery the peritoneal cavity in an open abdomen is deliberately left open anteriorly (Leppäniemi, 2010, p. 1). The abdominal contents of an open abdomen are thus exposed and are only closed with a transparent dressing such as an OPSITE dressing. According to Worhunsky, Magee, and Spain (2013, p. 33), the first open abdominal surgery was performed by Ogilvie in 1940 and during that time he used "canvas light" or cotton cloth sterilised in Vaseline to cover the abdomen temporarily. Since 1940 open abdominal surgery has become a daily procedure used mostlyin ICUs to manage critical and unstable trauma patients with abdominal injuries. Performing open abdomen surgery facilitates accessibility when doing repeated relook laparotomies, and also aids in the healing and prevention of abdominal compartment syndrome (Worhunsky et al., 2013, p. 33). Moreover, an open abdomen assists in decreasing mortality rate and preventing abdominal compartment syndrome (Navsaria, Nicol, Hudson, Cockwill, & Smith, 2013, p. 4). An open abdomen also assists in early identification of abdominal complications. Open abdominal surgeryis performed mostlyon trauma patients sufferingfrom penetrating injuries, blunt injuries, or a combination of blunt injuries and penetrating injuries. Penetrating injuries maybe due to gunshot wounds or abdominal stab wounds. Blunt abdominal injuries are usually due to assault or caused by pedestrian vehicle accidents, motor vehicle accidents and falls from a height (Kman, Knepel, Hays, & Menaker, 2012, pp. 1-4). According to Afrikaner Boer Genocide Archive South Africa (2009, p. 1), trauma units are like war zones. For instance, the Groote Schuur Hospital admitted close to 11,000 trauma patients in 2008, while South African academic hospitals admitted 127,000 bullet wounds in 2008. Trauma patients are treated as emergencies and exploratory laparotomies are usually performed to exclude internal bleeding in the abdomen. If the bullet wound is in the abdomen, a damage-control laparotomy is performed whereby the abdomen is left open to prevent abdominal hypertension, abdominal compartment syndrome and abdominal infection (Demetriades, 2012, p. 17). Severe abdominal sepsis, abdominal dehiscence, paralytic ileus, fistulas and acute respiratory failure are complications resulting from open abdomen surgery, irrespective of its life-saving benefits. Acidosis, hypotension, hypothermia, coagul-opathy and oliguria commonly occur in these patients (Cheatman et al., 2007, p. 954). These critically ill patients mostly lose proteins and fluids. Patients with an open abdomen stay long in hospital and in ICU, and this increases their hospital costs. Moreover, patients with an open abdomen are at risk of developing aspiration complications, pneumonia, pressure ulcers, thromboembolism and an abdominal abscess (Cheatman et al., 2007, pp. 951-962). Nursing patients with an open abdomen is difficult for the nursing staff. Patients with an open abdomen are very critical post-operatively, have a tendency to bleed profusely and are cared for in an intensive care unit. They thus need close monitoring of vital signs. Registered nurses in an academic hospital are expected to change the abdominal dressings, connect the dressings to suction, monitor intra-abdominal pressures and observe for abdominal compartment syndrome. Feeding, controlling pain and monitoring ventilator observations are other nursing tasks which registered nurses are expected to deal with. Patients with an open abdominal wound make nursing care difficult because they are usually hemodynamically unstable. Their nursing care differs from other hemody-namically unstable patients in the sense that the nurses have to constantly observe the open abdominal wound for bleeding, abdominal distention and abdominal compartment syndrome. The researcher observed that nurses in a specific intensive care unit did not like to nurse patients with an open abdomen. Nurses can become very stressed and some even refuse openly to nurse these patients and would rather be transferred to other units where there are no patients with an open abdomen. The abdominal wounds usually leak despite being connected to a suction dressing, and at times nurses are expected to change the dressing in ICU. Moreover, the patients commonly vomit and suffer from diarrhoea as they may not tolerate their feeds. Patients with an open abdomen may develop infections and most of the time nurses are blamed for these infections. Patients may also develop a fistula which is difficult to treat and may cause spillage of bowel contents. Patients are usually always wet and prone to develop bedsores even though they are turned frequently. In many instances nurses struggle to monitor abdominal pressure as they lack the knowledge and skills to perform these functions. In addition, in the academic hospitals there is generally no equipment to monitor abdominal pressure so the patients are at risk of developing abdominal compartment syndrome and which may thus go unnoticed. The questions are thus: What are the experiences of registered nurses caring for patients with an open abdomen in intensive care units? What recommendations can be made to assist registered nurses who take care of patients with an open abdomen in intensive care units? The purpose of this article is to explore and describe the experiences of registered nurses caring for patients with an open abdomen and to make recommendations to assist nurses in taking care of patients with an open abdomen in an intensive care unit in an academic hospital in Gauteng. Registered nurse: A person who is licensed to practise by the South African Nursing Council (SANC, 2005) and registered as a nurse or midwife as defined in the Nursing Act 33 of 2005. In this study registered nurses are nurses who are ICU trained, trauma trained and have managed patients with an open abdomen in ICU. Open abdomen: A surgical treatment method in which the peritoneal cavity is opened anteriorly and deliberately left open. It is also known as a laparotomy (Leppaniemi, 2010,p.1). An open abdomen is used for diagnostic purposes or as a surgical treatment (Peters, 2007, p. 333). For the purpose of this study an open abdomen refers to a surgical procedure performed during a laparotomy whereby the abdomen is left open post-operatively to prevent abdominal compartment syndrome. Caring: According to Jesse and Alligood (2014, p. 96), caring is the ethical and moral ideal of nursing with interpersonal and humanistic qualities. It is a complex concept involving the development of knowledge, medical skills, technical proficiency and interpersonal skills. Caring in nursing reflects care that ensures comfort and support for the patients being cared for by nursing professionals. A caring nurse should be able to cultivate a humane, understanding and compassionate approach in providing care and should understand the importance of humanity of the healing service (Searle, Human, & Mogotlane, 2009, p. 15). For the purpose of this study caring refers to tasks carried out by registered nurses regarding basic nursing care, hygiene, nutrition, fluid and electrolyte balance, ventilation and abdominal wound dressings, suction dressings and measuring intra-abdominal pressure in patients with an open abdomen. A qualitative, exploratory, descriptive and contextual design was used (Burns, Grove, & Gray, 2013, p. 692). Qualitative methods were used in order to gain in-depth knowledge about the experiences of registered nurses caring for patients with an open abdomen. The study explored and described the experiences of registered nurses caring for patients with an open abdomen in a particular intensive care unit in Gauteng. The design was contextual as it was conducted in a specific context where registered nurses in intensive care units were interviewed in an academic hospital in Gauteng. The research methods are described under the following headings below: Population, sampling, data collection, data analysis and interpretation, and trustworthiness. The hospital where this study was conducted is an academic hospital located in Gauteng and has five intensive care units. The population of this study was all the registered nurses in this hospital. The target population was registered nurses currently working in a specific trauma intensive care unit and totalled 45 nurses. The reason for choosing registered nurses as the target population was that registered nurses in that unit were experienced and knowledgeable about caring for patients with an open abdomen. Only one intensive care unit was chosen as the other intensive care units were cardiac, cardiothoracic, neurological, paediatric and do not admit patients with an open abdomen, and thus they did not meet the inclusion criteria. Sampling is the process used to select a portion of the population for the study. In this study purposive sampling was used which means that participants are chosen because their defining characteristics are necessary to make them the holders of the data for the study (Maree et al., 2012, p. 79). The sample in this study was thus made up of registered nurses working in a particular trauma intensive care unit in an academic hospital. The inclusion criteria, also known as eligibility criteria, were registered nurses who had worked in an intensive care unit in an academic hospital for more than a year. Focus group interviews were chosen for this study. Four focus groups were held, with six participants in each group. A total of 24 participants were interviewed. All participants were willing to participate and signed consent forms prior to participating in the focus group interviews. The participants also gave their permission for the interviews to be audio-recorded. The main question which was explored was the following: Tell me about your experiences in providing nursing care to patients with an open abdomen. The second question was: What are the recommendations that will assist registered nurses in caring for patients with an open abdomen? The interviews were conducted by the researcher while the nurses were on duty and when the intensive care unit was quiet to avoid any undue disturbances and to avoid nurses being called away during the interviews to care for patients. Some of the participants came to the interviews while off duty. Three focus group interviews were conducted during the day shift and one during the night shift. Interviews took between 45 and 90 min and were held in a boardroom in the academic hospital where the study was conducted. The room was quiet and free from noise and distractions, comfortable, safe, accessible and convenient, with good lighting. The participants sat in a circle to encourage interaction with each other and to be able to make eye contact. The participants were given numbers to pin on their clothes to maintain their anonymity and confidentiality. The participants, together with the interviewer, started by setting the ground rules for the group to facilitate respect and communication. Interviewing skills such as probing, clarifying and summarising were used by the interviewer. Focus group sessions were held until saturation of data was reached. Moreover, the researcher took field notes during the interviews. Refreshments were served before and after the interviews. The researcher analysed the data as the data was being collected. The data was analysed using Tesch's eight steps of coding (in Creswell, 2014, p. 198). Thus the data contained in the transcriptions of the interviews was analysed by an independent coder and consensus was reached regarding a central theme and sub-themes. Themes and sub-themes were later confirmed by the researcher's supervisors. The trustworthiness of this study was ensured by using the strategies of credibility, transferability, dependability, confirmability and authenticity recommended by Lincoln and Guba (Polit & Beck, 2008, p. 539). Credibility was ensured by engaging the participants for 45-90 min in the focus group interviews which enabled the researcher to obtain sufficient information about the experiences of registered nurses caring for patients with an open abdomen. The data was triangulated by means of focus group interviews, audio-recordings and field notes. The researcher ensured trans-ferability by choosing the sample of nurses purposefully and using directquotations from participants. Dependabilitywas ensured through a detailed description of the research methodology. Moreover a literature control was conducted. Confirmability was ensured by making use of two supervisors and an independent coder to code the data. The transcripts, audio-tapes and field notes were kept safe as evidence. By transcribing the participants' exact words verbatim in order to ensure their voices were honoured, authenticity could be maintained. Approval was obtained from the Academic Ethics Committee (AEC01-91-2014) and the Higher Degrees Committee (HDC-01-77-2014) at the University of Johannesburg, and approval was also granted by the CEO of the hospital and the head of the trauma ICU department. The researcher also obtained approval from the Gauteng Department of Health (Protocol number GP2015RP27). Ethical considerations were discussed using the four principles of the Belmont Report: the principle of respect for autonomy, the principle of non-maleficence, the principle of beneficence and the principle of justice (Dhai & McQuoid-Mason, 2011, p. 14). In addition, informed written consent was obtained from all participants prior to data collection and the participants were informed about the research purpose. By not revealing the names of the participants and keeping the records in a safe place their confidentiality and right to privacy were maintained. Twenty-four participants participated in four focus group interviews. Participants included both males and females. The ages of the participants ranged between 28 and 60 years. The three themes which emerged are described in Table 1. It was found that the participants experienced difficulties in taking care of patients with an open abdomen. 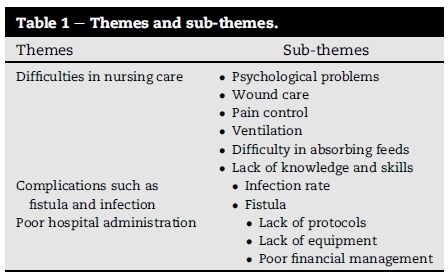 These difficulties faced by the nurses are discussed under the following subthemes: Psychological problems, wound care, pain control, ventilation and difficulty in absorbing feeds. "Nursing patients with an open abdomen is very tricky and challenging. For me basically it is more on the personal side. I was shocked atfirst. It was for thefirst time to see the real gut outside and the tubes lying around outside. It is really scary." According to Petro and Pedrao (2009, pp. 1-2), nursing is a stressful occupation because nurses work with people who are suffering and who need a great deal of attention, compassion and sympathy. Nurses become irritable, depressed and disappointed when they deal with this type of situation. According to Schecter, Ivatury, Rotondo, and Hirshberg (2006, p. 391), the major problem in wound care is leakage of large volumes of peritoneal fluid from the abdomen onto the patient's bed. According to Bogebjerg (2006, p. 22), there is always a high probability that the leakage occurs due to the failure of an adhesive. Moreover, the type of adhesive used, and how physically active the wearer is determines the risk of leakage. Leakages develop on the skin which surrounds the stoma. If the stoma is situated on a skin crease, at skin level or below skin level, or if the patient has gained a great deal of weight after the operation, a fissure is created around the stoma. It is then very difficult to get the adhesive to stick. As a result, the skin is exposed to faeces leaking beneath the baseplate.
" Control of pain. It is the most important thing (emphasis, nodding her head). If you dont control pain then you delay wound healing. We have seen in some instances where they have stopped all analgesia. Patients take long time to heal. The more you administer analgesia, you minimise patients to cough and minimise complications. Pain must be well controlled - more especially in the first few days." According to Layzell (2005, pp. 34-36), many patients still experience unnecessary pain despite the developments in pain control. A significant number of patients suffer from moderate to severe pain after surgery irrespective of the pain teams which have been introduced and the new techniques used for controlling pain. The occurrence of chronic pain post-operatively is due to pain that is not well managed after surgery. "Ventilation becomes a big problem because the open abdomen patients are predisposed to have abdominal pressure. They end up having problems with ventilation due to increased pressure in the abdomen. Hence the cardiothoracic cavity becomes decreased to the lungs and heart to pump due to circulatory ... (mumbling) ... mmm ... their normal work, their ordinary circulatory...."
What happens is that the diaphragm is pushed upwards and impinges on the thoracic cavity when there is intestinal gas, fluid and oedematous organs distending the abdomen (Lee, 2012, p. 5). The intra-abdominal pressure interferes with the patients' respiration and ventilation because more than 50% is dispersed across the diaphragm. Pulmonary dysfunction is the only earliest sign of abdominal compartment syndrome. The lungs cannot fully expand and respiratory excursion is limited causing reduction in inhaled tidal volume, resulting in hypoxia. "The feeding part of this patient is a problem. They end up with lots ofaspirates and vomiting due to increased abdomen. The stomach becomes smaller and can't contain all the stuff that you are giving. Patients not absorbing feeds end up being given TPN or are put on continuous drain." This observation confirms the reports that more than 60% of patients in ICU do not tolerate their gastric feeds (Tempest, 2011, p. 30). Signs and symptoms that indicate intolerance to parenteral feeding include vomiting, nausea, abdominal pain and distention, constipation and diarrhoea. Moreover, research has shown that gastrointestinal complications and not providing enough nutrition result in increased intensive care unit (ICU) stays (Tempest, 2011). "It is said to be done by doctors but funny enough the doctors don't know how to do it. We don't have equipment to do it and we end up using the CVP. We don't have proper abdominal pressure-monitoring skills and they take patients unnecessarily to theatre due to lack ofequipment." In a study by Wise et al. (2014, p. 1) a total of 2244 of the approximately 10,000 clinicians who were sent the survey responded. Most of the 2244 (79%) who completed the survey were physicians in training and the majority were living in North America (53%). The majority of responders (85%) knew intra-abdominal pressure (IAP), intra-abdominal hypertension (IAH) and abdominal compartment syndrome (ACS), but only 28% were aware of the consensus terms of IAH/ACS. This survey revealed that clinicians' knowledge of published consensus definitions, measuring techniques of intraabdominal pressure and the clinical management is insufficient although most responding clinicians claimed to know IAH and ACS. The participants were concerned about complications such as infection and fistula which also affect nursing care. The fistula spills bowel contents and patients are always wet making nursing care difficult. Hospital and ICU stays are prolonged in patients who develop infection and these patients commonly develop bedsores as a result.
" Even if we adhere to the aseptic technique, the environment where we are nursing a patient plays a major role. In our case windows are not opening. We don't disinfect adequately, so that's why we end up having infections even ifwe adhere to aseptic technique. One out of 100 do not get infection; 99% of them get infection" (with frustration in her voice, stressed, raising arms and dropping her shoulders). Intra-abdominal infection and intra-abdominal wound infection are the most deadly complications linked to an open abdomen (Worhunsky et al., 2013,p.36).Intra-abdominal abscess formation rates are reported to have increased between 10% and 70%. The infections are related to the amount of time the abdominal packs are retained in the abdomen.
" Other doctors don't use good material to do dressing. The suction is too strong and Ng tube goes to Mala (a Sotho name for intestines) and cause fistulas. Patients are getting complications and it is these fistulas which take long time to heal." According to Worhunsky et al. (2013, p. 36), the formation of an enteroatmospheric fistula is regarded as the worst complication of an open abdomen. The occurrence of fistula development is reportedly between 5% and 20%, depending on the indication. The exposed bowel does not have sufficient well-vascularised soft tissue and therefore the enteroatmo-spheric fistula becomes difficult to deal with and does not easily close spontaneously. A vacuum-assisted dressing applied directly over the fistula is one of the methods that is used to control the fistula as the dressing can prevent spillage and peritonitis. The participants pointed out the problem with poor hospital administration. This will be discussed under the following headings: Lack of protocols, lack of equipment, and poor financial management. The participants stated that theyhad problems taking care of patients with an open abdomen because of a lack of protocols in ICU which could guide the nurses on how to take care of these patients. "I feel patients with an open abdomen should have ....don't know whether to say a procedure or protocol. This starts when you nurse a patient with an open abdomen. You have to think of the sitting position, the changing ofdressing and the pressure ofsuction. Be put in a protocol. This is how to nurse patients with an open abdomen and this is how to do intra-abdominal pressure. As a guideline on how to manage patients with open abdomen." Plost and Nelson (2007, pp. 153-156) describe a protocol in an evidence-based model whereby the best nursing care practices were initiated, tested and used in ICU. It was found that increased survival rates for patients and a reduction of ICU costs could be attributed to an increased usage of protocols. Matlakala, Bezuidenhout, and Botha (2014,p.6) describe a study which was conducted in a South African ICU where a lack of protocols was found to be challenging in the ICU. A lack of protocols impacts negatively on nursing care. The unavailability of protocols in ICU means that nurses do not have any guidance and direction when it comes to caring for patients when doctors are not around. This is problematic for nurses and may result in medical errors and increased infection rates. "The suction point is not working. We use one suction point. Ifthe patient has open abdomen we need to have two suction points. One for the abdomen and one for the respiratory part. We are introducing infection." It is not only in this study that the participants complained about the lack of equipment, but Matlakala et al. (2014:n.p) also found that unit managers agreed that the right equipment was not available and if it was, it would inevitably be of poor quality. Insufficient supplies of equipment are thus proving to be an obstacle related to material resources. Available equipment found in ICU is often old and not in proper working condition. The participants stated that open abdomen patients have infections which lead to a prolonged stay in ICU and hospital. This puts financial strain on the hospital budget. "With infection it leads to a lot ofstrain on the hospital budget. Once they start them on antibiotics that are very expensive others develop multidrug resistance. They have prolong ofICU stay. We have to start them on inotropic support because they show signs of infection. They drop their BP. It'smoremoney into the system." According to Dhillon, Shah, and Rimawi (2015:n.p), ICUs carry a high risk for nosocomial infections, contributing to an increase in morbidity, mortality and healthcare costs. In order to reduce the occurrence of ICU nosocomial infections, healthcare providers should implement aggressive infection control measures. For instance, in 2002, the Centre for Disease Control and Prevention mentioned 417,964 healthcare-associated infections and 99,000 facilities in the United States among critically ill adults and children in ICU. The serious healthcare-associated infections involved catheter-associated urinary tract infections (40%), ventilator-associated and healthcare-associated pneumonia (25%), catheter-associated bloodstream infections (10%) and surgical site infections. • The findings of the study can add value to nursing education if included in the critical care nursing curriculum offered at nursing colleges and universities. • More research needs to be carried out on the experiences of patients to assess how they cope with open abdomen procedures and how the nursing care can be improved, thereby reducing their hospital and ICU stays which in turn will lead to reduced hospital costs. • Protocols to support nurses should be developed and implemented in intensive care units. • The compiled recommendations can be implemented in hospitals and training schools in South Africa. The study was carried out in an academic hospital with a small sample of registered nurses and therefore the findings cannot be generalised to other hospitals. Another limitation of this study was that it was carried out in only one intensive care unit in an academic hospital. The study found that the registered nurses were traumatised, stressed and experienced psychological problems when caring for patients with an open abdomen. The registered nurses had difficulty in carrying out their nursing tasks such as performing abdominal wound care, controlling the patients' pain, feeding and ventilating these patients. Lack of knowledge, equipment and lack of protocols added to the negative experiences of these nurses in the academic hospital. Furthermore, these patients often developed complications such as infection and fistula which affected nurses on an emotional level too as they found it difficult to nurse such patients under very difficult conditions. A model to facilitate the health of nurses caring for patients with an open abdomen is highly recommended as dealing with such patients causes a great deal of trauma, stress and frustration in nurses. Moreover, it would be of immense benefit to the nurses and the patients if a protocol could be developed that the nurses could follow. Prof. Nel was the co-supervisor and Mrs Kearns the supervisor in this research study. * Corresponding author. 742 Cosmo City, Virginia and Missouri Streets, Randburg, 2188, South Africa. E-mail addresses: chipu.mpho@gmail.com (M.G. Chipu), ikearns@uj.ac.za (I. Kearns), ewnel@uj.ac.za (W.E. Nel). Peer review under responsibility of Johannesburg University.